« Guilty Pleasures… Part 2! Hello again Sunday peeps! Thanks for stopping by once again to check out my writing and to leave comments. I read and appreciate every comment you leave here. Be sure to check out the other fantastic authors participating this week by CLICKING HERE! This week I’m sharing the a snippet from my upcoming release LOVE ON LANDING. Squee!! This is the second book in the Meadow Ridge Romance series, but fear not, you can read it even if you didn’t read the first — LOVE AND LATTES. Each book in the series focuses on a different character so you won’t be missing anything if you didn’t read the first. Alright! Enough chitchat. Let’s get to it shall we? And what better place to start a new book than at the beginning! Tali Radcliff leaned her head back against the headrest and gazed out the window. Raindrops splattered onto the double-paned glass blurring her view of the runway. Not that she could look past her sad, pathetic reflection anyway. The reflection staring back at her turned the raindrops to tears on her cheeks and she instinctively wiped them away, only to find her cheeks sensitive and slightly swollen. She sighed and closed her eyes, desperately trying to block out the urge to start crying again. Instead, she focused on the white noise of the engines revving as the jet picked up speed for takeoff. 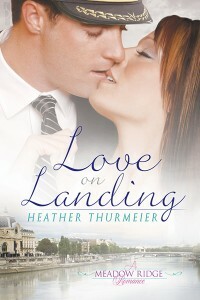 LOVE ON LANDING is coming Jan 28!! But don’t let that stop you from buying up your copy today! PRE-ORDER NOW at SILVER PUBLISHING! Are you curious about the book that started the series? Find out more about LOVE AND LATTES here! What a beautiful and poignant scene! Sounds like you have another winner, Heather. Super six! Wow, what an emotional scene! Ooh. This is good. Very good. I was totally there with her. Brought me back to when I was moving away from Texas. Great six! Wow, you do a great job of showing, not telling. Looking forward to more! I love how you have her trying to dig out of herself by looking out the window only to be sucked back in my her reflection. I also love the look of your blog, Heather. Great start. Love the imagery with the raindrops. Great emotions here. Awesome cover. Best wishes on the release. Sorry to have missed you yesterday. My first meeting in forever! This was such a touching scene. Poor girl. I already feel for her. Great six! Makes me wonder what happened! Poignant! Good opener that introduces the protagonist and asks several questions: Why is she so sad? Where is she going? I’d keep reading to find the answers. That her cheeks were swollen gave me a good idea of just how sad she is. Good job! You’ve captured my emotions, but I want to know why I’m so sad. A fabulous six! Vivid description of her sadness. Very poignant six! Nice transition from trying to look out to her reflection. Wow, this is a great six! Sad, but there’s an intriguing undercurrent to the melancholy. :c) And I LOVE the pic of you. It’s gorgeous! Wonderful opening scene! Congrats on the new book! Great writing. Love the raindrops/tears thing. This is so sad. I loved the reflection of the raindrops as tears. Beautiful. Pulls you right into her mood, very descriptive. Great excerpt!